"Abstract Article," the Cedar Street Galleries' current show, includes "Letter from Katmandu," an acrylic by Tsugumi Iwasaki-Higbee. FANS of abstract art will do well to head out to Cedar Street Galleries for its "Abstract Article" exhibit, featuring the new works Honolulu artists Chuck Davis, Tsugumi Iwasaki-Higbee, John T. Koga, Lauren Okano and George Woollard. First-time visitors, be warned: Cedar Street Galleries isn't about Location, Location, Location. In fact, while Chinatown has its own art district that is packing in the crowds each month at its First Friday event, and Kailua is aspiring to similar success with its Second Sunday artwalk, this gallery resides in a no-artman's-land. Cedar Street is a quiet side street situated within the giant block between Keeaumoku, Piikoi and King streets and Ala Moana Boulevard. 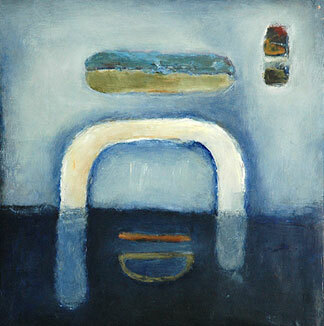 Nevertheless, the gallery is worth a visit every now and again, because it houses the works of many top isle artists. It's a treat to step in the door and see so much talent everywhere you turn. "Abstract Article" runs through Sept. 17 at Cedar Street Galleries, 817 Cedar St. Gallery hours are 10 a.m. to 5:30 p.m. Mondays, Thursdays and Fridays, and 10 a.m. to 4 p.m. Tuesdays, Wednesdays and Saturdays. Call 589-1580. 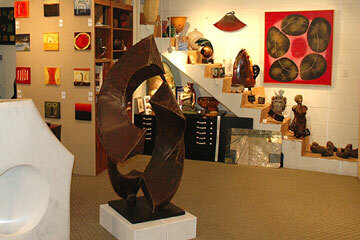 Cedar Street Galleries is tucked far away from the bustling art districts, yet houses works by many top isles artists. 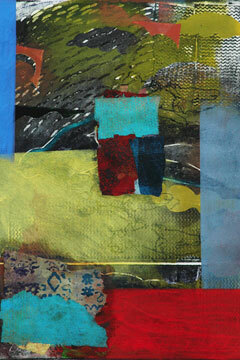 "One & Only" is a mixed media piece by George Woollard. 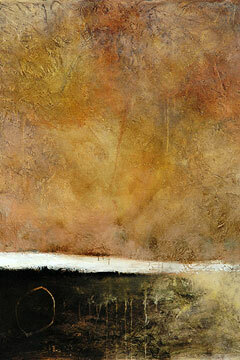 Chuck Davis' "Pilgrimage," an acrylic painting. 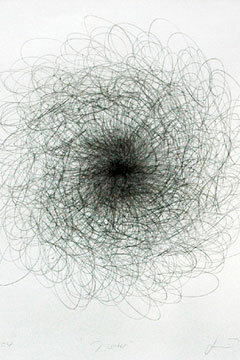 John T. Koga's "Initials II" is a graphite drawing.